Like thousands of other Americans, our son Jason is out of work right now. Well, he’s actually working part time at a fast-foods place and going on job interviews. I’m so proud of him for stepping up and doing everything he can for his new family. His wife, See, is pregnant, due in July. This is See and Jason just outside Denver last May, when I flew out to meet her just before they were married. A cacophony of thoughts cascading into a mural of shimmering imagery. Brings a sudden tear within a tear, gushing forth the life water of the human soul. A trumpet plays, carrying the idea of hope amongst its angelic tone. The gleeful shouts of children dancing in the midst of the happiness of Hope. He looks down from above. A wave of his hand dispels the clouds of worry and vanishes the dust of anger. A boy glances up in awe. He sees the heavens part and knows that he is seeing the coming of truth. Darkness comes, from the earth, the sea, and the sky it carries the chill of death and despair. The boy vanishes with the winds of time and time’s gentle sand becomes as hard as a rock. An eagle soars with courage and strength. His wings pierce the tornado of hate before him. The Evil one glares. He stretches forth his hand and lightning shoots with a bang. And as the eagle falls lifeless from the sky, the clouds close from view the heavens once more. The trumpets turn to drums, and they beat a muffled somber sound. People roam the street aimlessly searching for the Why and the How. Above the Man’s attention is elsewhere, but still he hums idly to himself as life goes on. 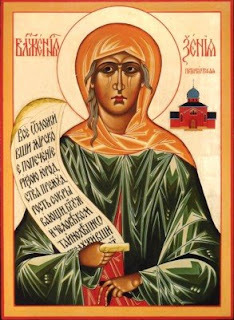 Holy Saint Xenia, please intercede with Christ, Our Lord, and bless my son, Jason, and others searching for jobs today.